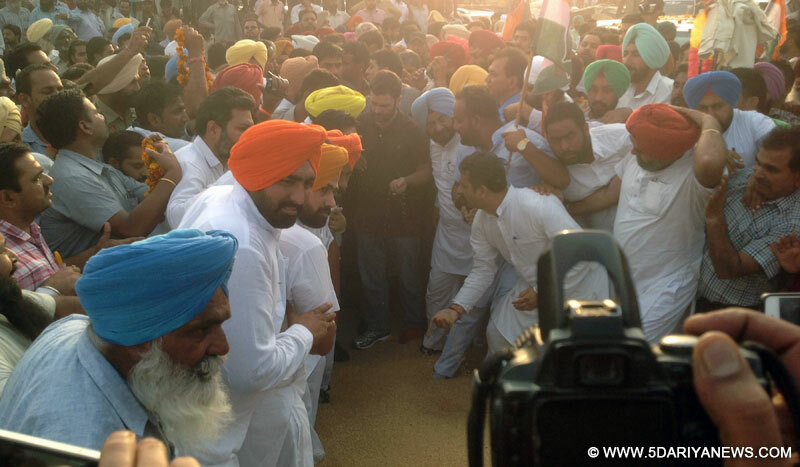 Congress vice president Rahul Gandhi on Tuesday said the land acquisition issue will get bigger. "It is a central issue (land acquisition ordinance brought by the Narendra Modi government). I have said that those (farmers) who provide food to this country, their lands are being snatched from them," Gandhi told the media while travelling by train from Delhi to Ambala. "This is wrong and we will counter this," he said.The Congress is opposing the Modi government's move to bring a fresh law on land acquisition, saying this will allow forcible acquisition of land of farmers.Talking to the media at various stations along the Delhi-Amritsar railway route while crossing Haryana on board the Sachkhand Express, Gandhi said he was going to Punjab to get first-hand knowledge of the problems being faced by farmers in lifting of wheat stocks and the damage suffered by them due to unseasonal rains recently. "I am just going to see what's going on there (in Punjab). I am going to the grain market and want to see what is the situation on the ground there. "I have been told that things are in a bad shape and I want to see things myself," he said.Asked about the BJP terming his recent activities as a political gimmick, Gandhi retorted: "What do they (BJP) want me to make everything? Non-political? "After alighting from the train in Ambala, Gandhi went to Sirhind and Khanna grain markets in Punjab to meet farmers.